A corporation is formed by filing a single document called the Articles of Incorporation (some states refer to it as a Certificate of Incorporation). The Articles of Incorporation are filed with the state. The specific agency with which you file varies by state, but will typically be your state’s Secretary of State, corporation commission, or corporation division. Although running a corporation is an intricate process, starting a corporation is easy. Your corporation will need a distinct name. Every state has an online database through which you can search to find an available name. The available name will belong to your corporation once the state has filed the Articles of Incorporation. You do not need to reserve a name prior to filing, unless you are forming a corporation in Alabama. All states require a corporation to appoint a registered agent. Registered agents receive official mail and service of process (notice of a lawsuit) on behalf of registered business entities such as corporations. Registered agents must be an individual or business that resides in the state where the corporation was formed, and the registered agent must be available during regular business hours and have a physical address where they can receive service of process (this address is called the registered office). The incorporator’s name and signature (a corporation’s incorporator is the person authorized by the corporation to complete the Articles of Incorporation). Most states allow you to complete the Articles of Incorporation online. In other states, you must complete articles on paper and submit them by mail or fax. When you do submit the Articles of Incorporation, the corporation become active when the state processes the articles. The state will send you confirmation (sometimes a pretty certificate, sometimes a bland piece of paper—depends on the state) that your corporation has been formed. After you’ve submitted your Articles of Incorporation and received confirmation from the state, you’re done! You’ve successfully started a corporation. Corporations are owned by shareholders. 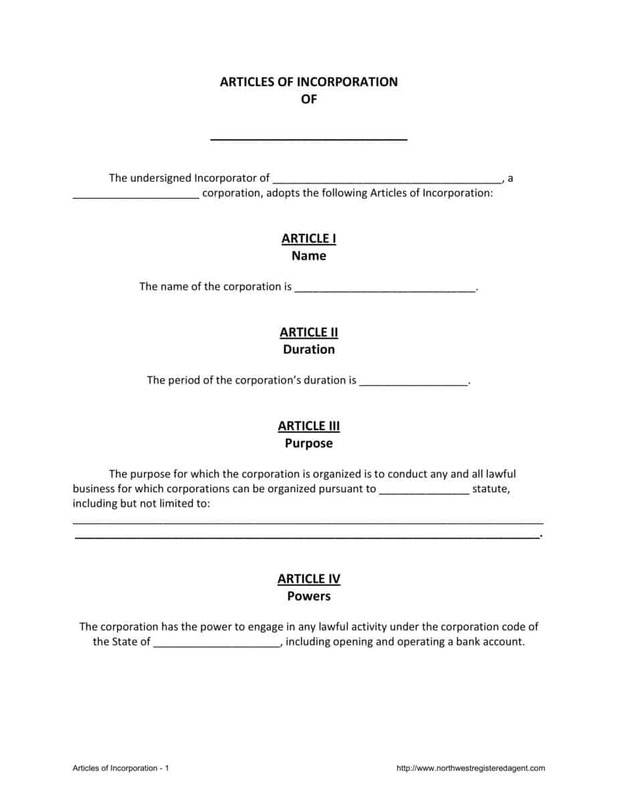 Corporations issue a number of shares of stock when they file articles of incorporation. The shares are how the corporation is initially funded. The shareholders are given an amount of shares either physically or by just writing it down in a corporate journal according to how much money they invest in the company. Not all of the shares have to be issued or given out initially or at any specific time. The shareholders then have a right to vote in the corporate meetings because of the shares they own for investing their money in the corporation. If you’ve owned shares of publicly traded companies on Wall Street, your votes are basically worthless because there are so many shares issued and owned. In private companies, it’s totally different because you’re usually talking about a few shareholders and the main founder of the corporation usually will always maintain at least 51% of the shares to control the company. Shareholders or the initial incorporator elect the directors. The directors then elect the officers like a President, Vice President, CEO, CFO, Secretary, or Treasurer. Most states require you have at least a director, president, secretary, and treasurer. Directors and officers have fiduciary duties to their shareholders. Some states allow Close corporations which can operate without the appointment of a director. In theory, each year the shareholders hold an annual meeting, where they elect their director(s) and then the directors elect their officers. Most states have language in their laws that basically say it’s ok if the shareholders fail to have and hold an annual meeting, and that the current or initial directors and officers can maintain their office until a special or annual meeting is held, regardless of if a new meeting never gets held. What Do I Need To Do To Keep The Corporation Going? Corporations will have to file annual reports with the Secretary of State in the state you incorporate in. We have full step-by-step instructions on filing annual reports. Corporations are also supposed to hold annual meetings where you go over the business for the year and elect directors and officers. Most states have language in their laws that will try to say that failure to hold these meetings is not a basis to pierce the corporate veil. Most small private corporations fail to do this. How To Fund The Capital Or The Corporation? You basically buy shares of the stock the corporation issues in the articles of incorporation. Just the same as you would on a stock broker site or buy shares of a mutual fund you invest in for your retirement account. Just as you would with a mutual fund, you don’t actually get paper certificates. You could make them up if you wanted to, but usually people just have it written down in their corporate journal how many shares they own. We do offer a free stock certificate template you can print off and fill out. Or you can buy a corporate book and seal when you sign up for incorporation service. Usually when people open up a business bank account under their new corporation, the first check is from them personally. Can One Person Be All The Roles Of The Corporation? Where Is The Best State To Incorporate In? If you’re doing business in your home state, the best place to incorporate in will always be where you live. If you’re doing things on the internet or using the company as a holding company for assets, incorporating in a tax friendly state like South Dakota, Wyoming, Nevada, Montana, or Delaware are nice options. Forming a company in a tax free state like Wyoming usually won’t be of benefit to you if you live in a normal taxing state like New Mexico or anywhere with a normal tax burden. Living in a place like California, New York, New Jersey, or any state with high fees and high taxes, can present some nice options of forming a corporation out of state and trying to run some of the income through it that way. The corporation is automatically a C corporation. The C Corporation keeps the money from getting down onto you personally where you might need to pay a high personal income tax rate in a high taxed state. Declaring the corporation an S corporation with the IRS will pull the net income down to you personally. At the end of the day, it’s always simplest, and sometimes cheaper in the long run, to incorporate a corporation in your home state rather than playing the tax hide and seek game. We’ll be glad to help you no matter what you decide. What If I Want To Do Business In Every State? We would recommend incorporating in a tax-free state like Wyoming, South Dakota, Nevada, Delaware, or Florida. How Do I Pay My Taxes To The IRS? The IRS charges a percentage of your NET taxable income after you take your deductions off the money you made for the year. The Internal Revenue Service charges the percentages on a sliding scale, meaning you pay the percentage for each bracket. So if you made $20,000 net taxable income for the year, the first $8,350 would be taxed at the lowest bracket of 10% and the next $10,000 would be taxed at the 15% bracket, and up and up and up with more money. As you can see, the middle class is who pays most of the taxes in America. The single person making a good wage over $34,000 a year gets stuck with a huge 25% tax and the married couple making over $68,000 a year also gets a big 25% tax. If the government really wants to limit the burden on the middle class they should drop both brackets down to 15%. Corporations are naturally classified as C corporations. In other words, a generic simple corporation. A C corporation files an 1120 corporate tax return at the end of the year and pays corporate income tax at the above levels. If you don’t want to pay corporate tax, you can declare your corporation an S corporation by filing a form 2553 S corporation election with the IRS. This will cause the income of the corporation to be taxed on you personally at the above personal income tax rates. In this scenario, you’ll file an 1120 S return. You’ll report your share of the income on a K1. How Do I Pay My Taxes To The State? As the same with the IRS section above, you’ll either pay it corporately or personally. Most states recognize the same IRS election you have federally. There are a few states that don’t. We have provided each states personal and corporate income tax rates below on the state links. What’s Better? An LLC Or A Corporation? The big benefit of a corporation as opposed to a LLC in my mind is the savings in the fees you’ll pay a tax professional at the end of the year to prepare your taxes. A CPA should charge you around $400- $500 for a 1120 return. And then they will probably charge you another $400 – $500 for your personal return and counsel. An LLC gets a 1065 return filed, unless it’s a total disregarded entity. Usually LLC tax returns will run $600 to $800 to get them done by a CPA. Every situation is different, but any CPA will tell you it’s simpler and quicker for them to file a 1120 return instead of a 1065. Another benefit is just a stereotype. But with the popularity of the LLC now, it almost comes across a little more professional having an “INC” at the end of your name. This is just a trend, and don’t get me wrong. We operate in most states as Northwest Registered Agent LLC, except for the states where being a registered agent has a requirement of being an “INC”, we operate as Northwest Registered Agent Inc. When people see an “INC” behind the name of a business now, it kind of comes across as a little bigger, longer established company. In general, a corporation just doesn’t make sense for smaller start up businesses. The LLC is just simpler and easier to get going and deal with tax wise. The real trouble people see with corporations and taxes is they go through the year, formed the “INC” and then made a bunch of money and get stuck paying the higher corporate tax rate. Starting an “INC” and making it an S corporation, forces you to start paying yourself payroll, which is time consuming, more paperwork, and a general pain for a business startup where the only employee is the owner. An LLC allows you to just pay your taxes as a disregarded entity in your first year, without doing anything with the IRS. When you need money, you just pull it out, and have your accountant clean it up at the end of the year, so you can keep focusing on running your business and pulling in the money. Learn more about Corporations Vs. LLCs. Learn more about Benefit Corporations. We are a national registered agent and incorporation service. That means that we pay income tax to every state and operate in every state. We do incorporations for our clients every day. We’re not just a document filing company. We get hired by attorneys and individuals every day to not only incorporate their business, but get the business set up and registered with various state agencies to actually start doing business. You can see the state filing fees for the state you would like to incorporate in by looking at the first couple questions on the sign up form below, or you can see more specific information on each of the states below. As an additional option, you can incorporate yourself, and just have us be your registered agent. When people sign up for registered agent service only, the correct forms and filing instructions are presented to you immediately after signing up for registered agent service. If you would like to move your existing corporation to Wyoming, we can help you do this in a few easy steps after you signup online. If you would like to do it yourself, and just hire us as your Wyoming registered agent (which you’ll be required to have), you can just get everything from your home state and file all the paperwork yourself. Our price includes our $150 fee prepare and file all the paperwork with Wyoming (or some of the old popular states to incorporate in like Nevada, Delaware or Florida) and your home state, state fees and 1 year of our registered agent service.